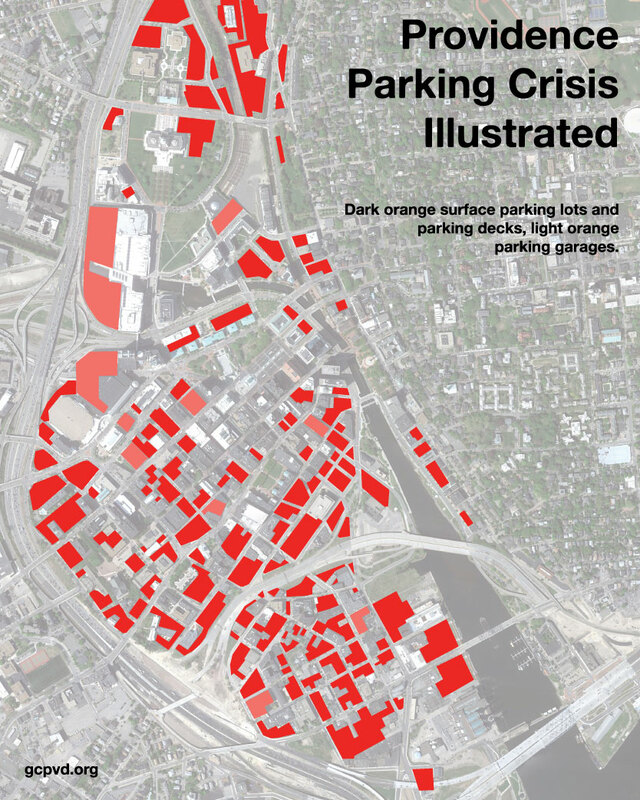 Like many American cities, Providence has a downtown parking crater problem. About 70 acres of prime land in the central business district is occupied by surface parking. James Kennedy, a local advocate who blogs at Transport Providence, is on a mission to fix the problem. Inspired by a similar policy in Pittsburgh, he wants the city to tax surface parking lots and use the revenue to reward the owners of walkable urban buildings. Kennedy’s idea is starting to gain notice, with Mayor Jorge Elorza recently weighing in. Elorza is hesitant to support the idea, but Kennedy thinks he can be won over. The 40% tax set by Pittsburgh — the highest in the country, although theirs was at one time set at 50% — collects more revenue for the city of Pittsburgh than the income tax in that city. Providence should do the same, but give all the money directly into lower property taxes on actual buildings. You may resent paying high parking rates, but if your taxes are cheap on a beautiful, centrally-located building, guess what? You’ll adjust. Buildings will be taken care of better and new buildings added because of the corrective force on land prices. It’s not just that you’re taking away the competitiveness of parking, which sounds anti-market. What’s actually happening is that parking is competitive for government-created reasons, and you’re putting the land parcels back into a natural market such as would exist in any gradually developing city. Owners of lots can choose a variety of things: One could still own a plot of land, knowing that parking won’t provide the boost that it did, in hopes of that “perfect deal” for the expensive skyscraper. One could build a place-holding building to provide temporary uses, or open the land to outdoor tent bizarres, and hold onto the land but avoid the tax. Or one could sell: but selling means selling the expected tax alongside the favorable location of the land, so the price will go down. A lower land price sounds ominous, like something’s wrong with our city. But remember, if you were building a new Providence like Roger Williams did, the land just beyond the last settlement would be the cheapest land within the pale of the city, not expensive. And so you’re allowing for the great market creativity of the past to come about again. Reduced land prices mean that the improvements to that land have a disproportionate value, increasing the value of buildings all around. And that’s exactly why we need the parking lot tax. We’re not waiting around for glimmering “oases” of asphalt. What we want are buildings, in the form of neighborhoods. Kennedy is urging readers to tell Mayor Elorza they like the idea. Elsewhere on the Network today: Urban Cincy notes that in a ranking of regions by efficient use of land, Cincinnati scored in the middle. Greater Greater Washington unpacks the history of streetcars in D.C. And Grist explains a new study examining the relationship between urban density and driving rates.